Nashville — Informing Design, Inc.
Informing Design was tasked with a complete City-makeover, wayfinding-wise, in 2006: traffic signing, pedestrian maps, bike maps, healthy walk sign system, greenways map and sign system, and visitor maps. The loop of expressways around central Nashville had long been a source of driver confusion. (See the “Therapy for Nashville’s Driving Disorder” case study.) Informing Design’s aggregate effect mapping came to the rescue: new expressway signs pointing to the major City Districts will be going up soon, replacing an overload of specific destination supplemental signs. Once off the expressway ramps, motorists are led onto corridors for each of the Districts and then to parking for attractions with new signing inspired by the shape of a guitar in a specially developed reflective ink guitar-brown color (with a distinctive pastel blush to the brown). Signs pointing out to neighboring districts or out of the city altogether are distinguished by the use of traffic green on the signs. Using its signature de-complexifiying map tool, the firm remapped the highway system throughout the County at four zoom levels, geo-referenced for web applications. This guided the routings for traffic signing, and served as the basis for web and app applications as well as for the pedestrian map kiosk system. 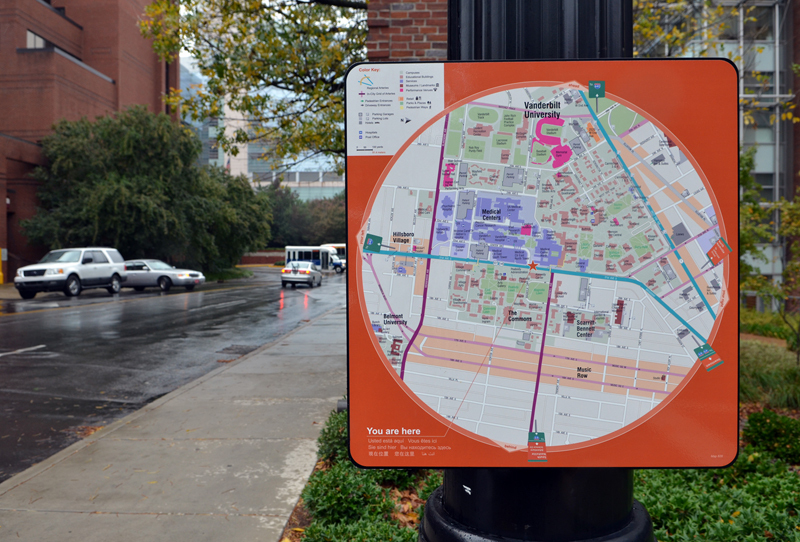 The firm deployed around 150 “personal map stations” on sidewalks in Downtown and the West End/Vanderbilt districts. See “A Less Embarrassing Map Kiosk” case study. 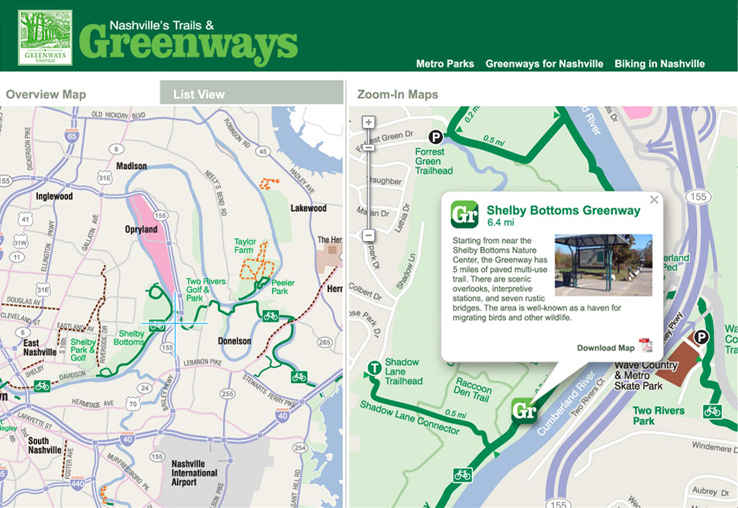 For the city’s vast (and expanding) network of Greenways, the firm was tasked with developing a large format print map and a double-map mash-up web site. Detail trail maps of major parks were also designed. To see the maps in action, click here. No one expected a mid-south city to have an extensive network of bike-friendly routings, but that’s exactly what Informing Design discovered using its “islands and bridges” bike mapping tool. “The Groove” bike map was an instant hit, and is now in its third print edition. The maps are also displayed on kiosks at all of the B-cycle bike-sharing stations around the city. See the “Bike Maps, sans spaghetti” case study. Metro Health in Nashville has a large focus on improving health in disadvantaged neighborhoods. As part of that effort, the firm designed a network of map kiosks specifically designed to entice walking (and biking) to sources of fresh food and interesting sites. The signs included interpretive illustrations and text on local lore and historic sites. Copyright © Informing Design, Inc.